Gigabyte has taken a shine to the recent GeForce RTX 2060 GPU by releasing a whopping six models. Sensibly, there's a slightly overclocked mini ITX model, a couple of twin-fan versions that are otherwise unremarkable, and then a trio of three-fan jobbies that push the GPU as far as anyone else. It is generally the case that a manufacturer will spend a decent amount of money developing a premium heatsink design and then use it on multiple GPUs. Minor under-the-hood modifications are made to ensure compatibility with, say, different power inputs, VRM locations or memory placement on a particular model, but that's pretty straightforward in the grand scheme of things. This is why the Gaming OC Pro looks so much like the GeForce RTX 2070 we reviewed recently. The middle 80mm fan spins in the opposite direction to the other two, ostensibly for better airflow, and the trio turns off when GPU temperature is below 60°C. Unlike its bigger brother, there is no evidence of the revving sound when the temperature is close to the switch-on 60°C - Gigabyte has fixed it with a BIOS update. It's fair to the say this RTX 2060 does not have the bulletproof build feel of the Founders Edition. It makes up for that in other ways, including muted RGB lighting behind the Gigabyte branding on the side and an elevated core speed of 1,830MHz, compared to 1,680MHz for the FE. Memory speed remains untouched, running at 14Gbps. Those frequencies don't make it quite the fastest RTX 2060 around - subsidiary brand Aorus clocks its sole version in at 1,845MHz, yet expect this Gaming Pro to outdistance the FE by a few per cent in our benchmark suite, making an excellent fist of FHD gaming and being thoroughly decent at QHD. Card measurements of 280mm (l) x 116mm (h) x 40mm (w) and an 808g weight put it in the average category on all fronts, and we appreciate that a single 8-pin power connector is all that is required - RTX 2060 really is a mainstream GPU from an energy perspective. A backplate is considered a bonus on a model that isn't the highest in the range, and looking under the cooler shows that Gigabyte does cover all VRMs and memory with a combination of thermal tape and heatsink. One key departure between this and the 2070 model is the lack of USB Type-C support, which is also provided by the Founders Edition. It seems no partner is willing to add it in for its RTX 2060. What remains is a trio of DisplayPort 1.3 and a solitary HDMI 2.0b. 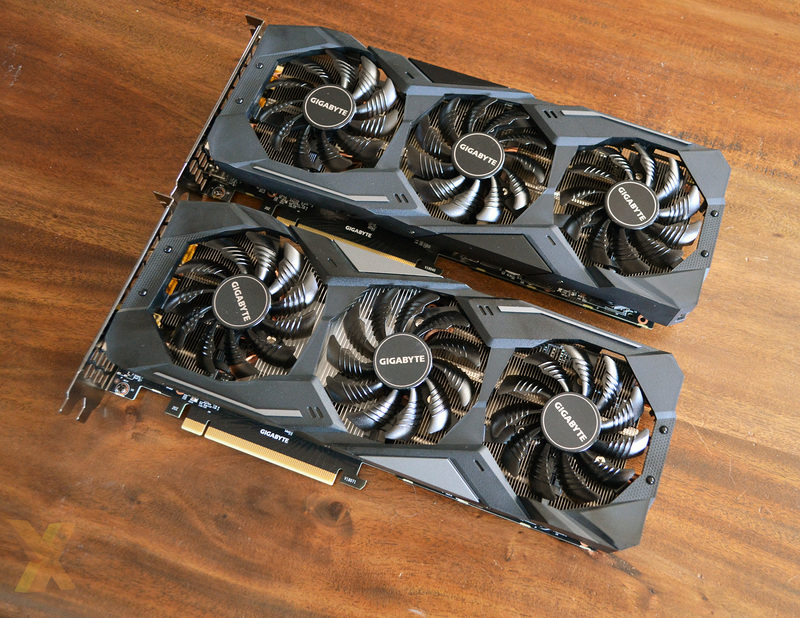 The question that has constantly arisen when looking at the RTX 2060 is whether partners' cards are worth the inevitable price premium over the well-built Founders Edition? Gigabyte's £370 is actually pretty good - others charge between £380-£450 for the same speed privilege - but that still represents an extra £40 or so on top of Nvidia's own effort. Is that enough for the extra speed on the core? And is there a rival from the red team that steals the thunder? Let's find out by running some numbers.